An Easter song and a sculpture. And so she did! 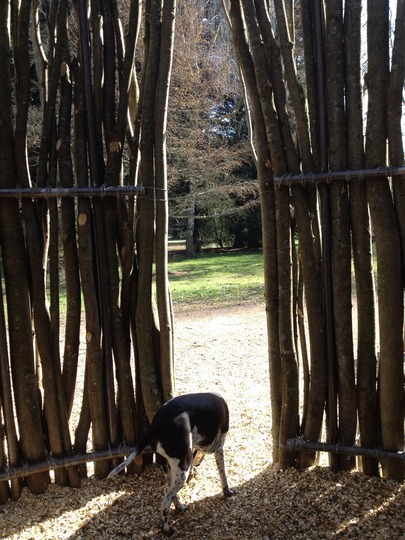 Pru, Jazz and me went to the Westonbirt Arboretum and had the most magical walk. I sat on a bench and enjoyed the view and the pups has a good play chasing each other around the trees, making people smile! It’s not often Jazz and Pru, who are litter sisters and 8 years old get to play with each other, as dog playing is usually a 2 dog affair. When Sluggy, Pru’s daughter joins in it turns into a bun fight. Sluggy is always the one who is playing with either one. So it was a special moment for the two of them. I was about to turn for home when I saw the sign for the 2,000 year old lime tree. 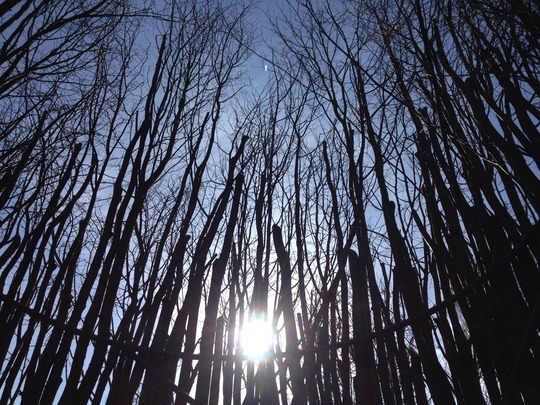 Well actually it’s a coppice and the whole area is a large ring of full grown and some coppiced Lime, dating back centuries. I remembered that they have recently made a new sculpture. It’s such a simple design, with such impact and being quite early morning we were the only ones there. It had a very magical feel inside, as many circles do. 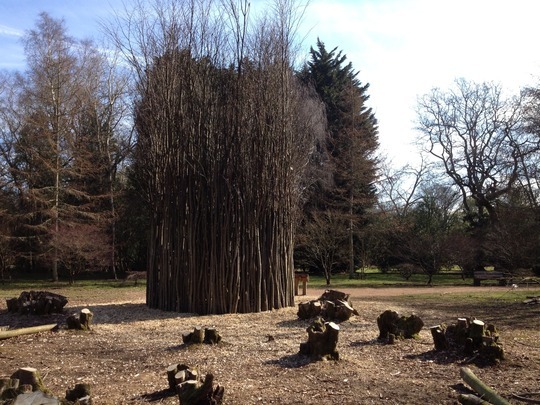 This is the sculpture as a Whole, surrounded by the coppiced Limes. Here’s a bit of Easter day magic! Looking up from the inside. It’s not often I like woodland sculpture. This one really took my fancy. 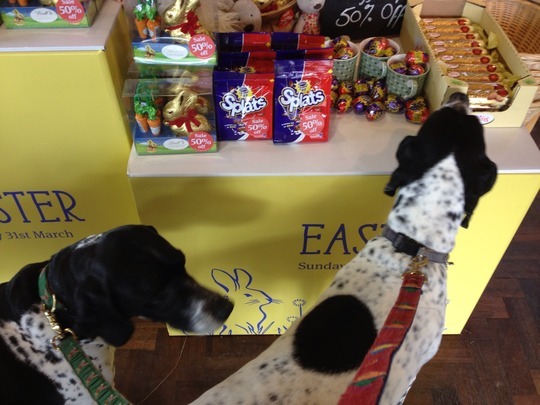 On our way out we passed by the shop as a friend had asked me to look for an Easter egg they’d forgotten to buy……the girls headed straight for them! 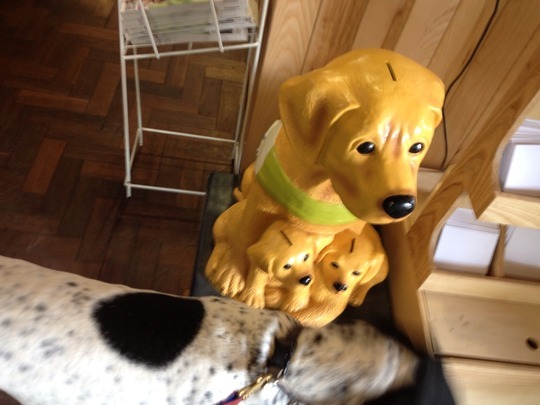 They even thought they’d made a friend in there! All and all a very peaceful walk indeed. Am now gardening, (came in for a cuppa and a blog!) and Sluggy, being a bit bouncy having not been for a long walk is terrorising the pheasant through the patio windows, a male and female have come for a feed. Lots of whining and pacing! Am definitely not going to open the doors! I hope the sun has shone for all of you today. Happy Easter. Next post: Possible Polytunnel Guardians! Lovely walk for you all , Lulu . We had long intervals of sunshine today , had a delightful walk on the beach , and met lots of happy people . There were plenty of dog-walkers ; one man had 10 rescue dogs , only two were on leads , I think he was a bit overwhelmed . I said to him that he must have a large house , OH , ever the joker , said that he must live in a large kennel ; I don't think that he was too amused ! I managed to get into the greenhouse when we got back , which was an added plus factor to the day . Lovely blog Lulu. What a nice place to visit. 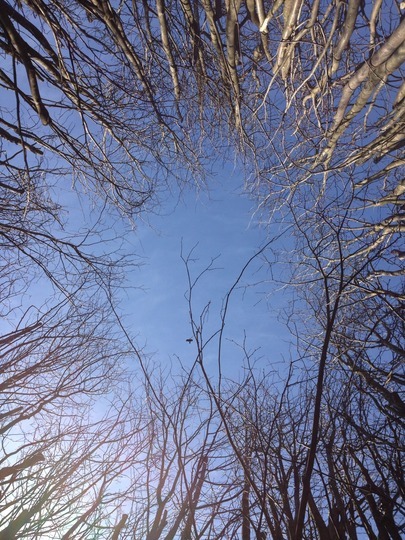 Those trees are so beautiful, I really love the picture looking up into the sky with the bare twigs all around! 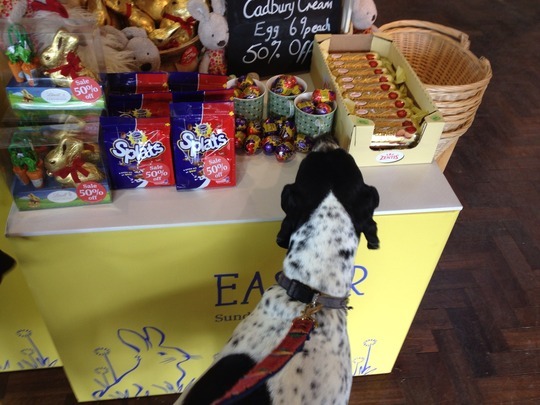 Bet Jazzy and Pru had a wonderful time ~ how many Easter eggs did they buy? 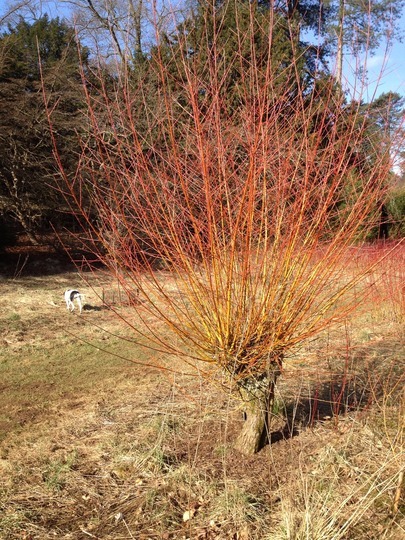 Beautiful winter colours, very sunshiny photos. Driad it's hard enough with three big dogs! But a walk on the beach, how splendid! Glad you all liked my sunshiny walk. Stickie the shot you liked was taken inside the sculpture looking up. Hi Spenny! HB and Yorkie! Not quite so sunny today. 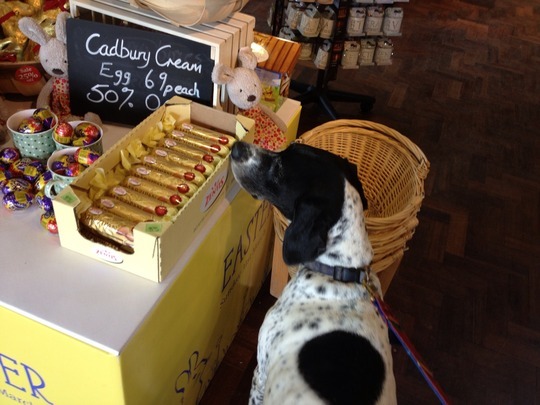 I am off to Marlboro today for a family meal and Easter egg hunt! I am collecting eggs for my friend Leah, whose dog ate all of hers! hope you find lots of eggs for Leah ~ and some for you too! Youngest son and I made some ~ found a little chocolate egg mould, melted some chocolate ~ three colours then had fun putting different things in the chocolate! i might have to eat the one with popping candy in cos no one else did! 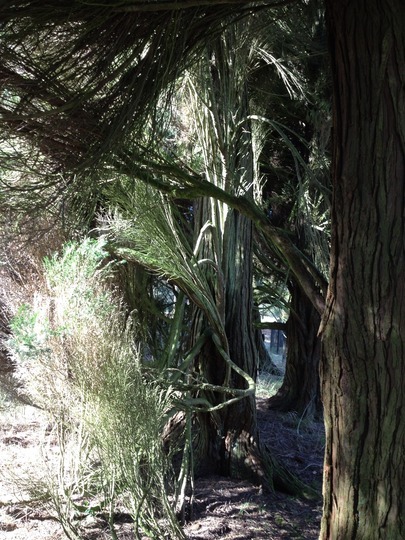 A very nice blog :o) I would have loved to be inside that circle of trees. I hope sluggy didn't feel too lonely at home on her own. great song Lulu, drop bottom E down to a D & your off ! Fantastic Blog I love the 6 and 7th Pictures , Wow! 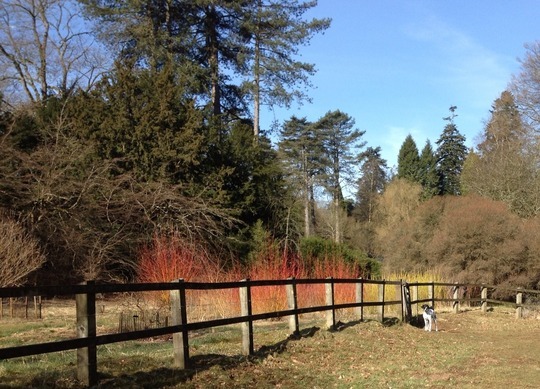 Lovely blog, I do love Westonbirt, I've been there a few times on holiday and always love it. I found 9 eggs on our hunt but wasn't really concentrating because I was chief photographer! Well done with making your own eggs Sticki! Hywel, Sluggy was being cosseted at home and fed treats! I took them all out to a lake today, so I think I'm forgiven! Skips.....well hello! Long time no see! Lovely place Louisa, just adore it, especially early with no one around. Bampy, you will have to serenade us when you stop by! Did a trial arrangement which I might youtube though! If you come here and sing you will be joined by The Pointer Sisters! "Whooooo whoooo wuff!" Bampy and the Pointer sisters!! are they going on tour? I know i know I know i know! "It's raining chocs , Alleluia , it's raining chocs , Allelulia !" I'm so excited....da da dada dada! I spy a cat...with her eye on the bird!